Having lived in Hawaii for a total of about 11 years, I’m often the “go-to” gal for all sorts of Hawaii questions from my friends on the mainland, especially as they plan a trip to the islands. 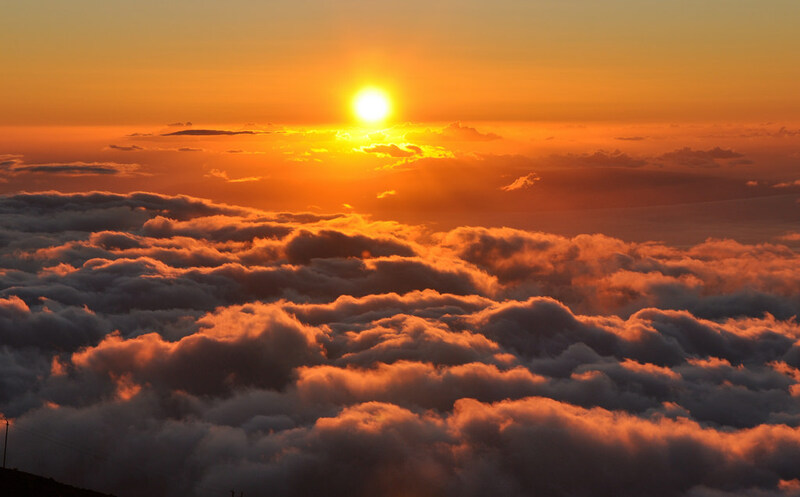 One of the most common questions I’m asked is this: Should I visit Haleakala on Maui at sunrise or sunset? They’re almost always disappointed with my answer, which is: It depends. You expect you’ll be jetlagged anyway. Many visitors from the East are up at dawn the first few days, so it makes perfect sense to visit during sunrise. For those who are just “morning people,” the same rules apply. You like the cultural significance of Haleakala at sunrise. Haleakala means “house of the sun,” and the name has to do with a Hawaiian legend. According to the legend, the demi-god, Maui, climbed to the 10,000-foot summit of Haleakala, where the sun was asleep in the giant crater. Maui hid until morning and watched the sun begin his daily journey. As the first ray of sunshine appeared, Maui snared it with his lasso of twisted coconut fiber, in order to make it slow down across the sky. The sun demanded to be released, but Maui would not let go. “Promise me that you will move more slowly across the sky,” he told the sun. Left with no choice, the sun struck a bargain: He would move slowly for six months out of the year, and then move at his preferred pace for the other six months. Sunrise atop Haleakala is typically more crowded than sunset atop Haleakala. You’re OK with crowds. 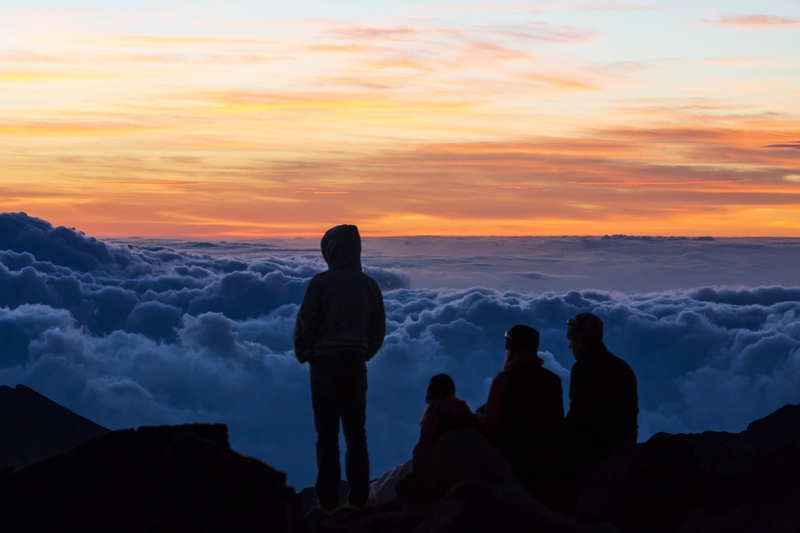 Sunrise atop Haleakala is one of the most popular visitor experiences in Hawaii, so you should expect large crowds when you arrive. However, if you plan your visit during off-peak travel periods (like September and October), you’ll likely find fewer brave souls atop the crater. You don’t feel like rising early. I get it. You’re on vacation, and you probably want to relax. If you go at sunrise, you’ll need to plan on a 2.5 hour drive from Wailea, and a 2 hour drive from Lahaina and Kahului. However, if you plan your trip around sunset, you can leave around 2 p.m. and still get there in plenty of time to enjoy the sunset. You don’t like cold weather. It’s decidedly colder around sunrise than sunset (usually, anyway). So, those who have an aversion to the cold will want to wait until sunset to visit the mountain. Keep in mind, the weather atop the crater can be unpredictable. Visit hawaiiweathertoday to keep tabs on the weather conditions. Haleakala at sunset can be just as spectacular as sunrise, depending on who you talk to. You want a little more privacy. Sunrise crowds are typically much heavier than sunset crowds. So, if you want a little more privacy, waiting til sunrise is the way to go. The jury is still out about which sight is more spectacular: sunrise or sunset. You’ll find folks who say they’re equally beautiful. Others will say one or the other is more picturesque. And, who says there’s anything wrong with a daytime trip to Haleakala on Maui? A daytime visit might afford you more time to explore the crater, without being overtired. At Hawaii Aloha Travel, we offer a Haleakala Crater Hike that showcases all the crater has to offer, including a hike through this amazing and historic venue. No matter which time of day you visit the crater, expect to be amazed. Haleakala is one of the most culturally significant and beautiful places in Hawaii. As long as the weather cooperates, you really can’t go wrong!